With the release of Android OS Emulators for PC, now you can actually run android apps meant for tablets and phones on your PC or laptop. That means, you can even use Whatsapp on your PC! First up is Youwave which has a price tag. I am not going to dwell into Youwave because I prefer the second one which is FREE but equally good, if not better (at least in terms of UI). My preferred emulator is Bluestacks App Player. It is free and works well and you can even sync your apps on android devices with the Bluestacks running on your PC or Mac by downloading the Bluestacks app for Android devices. Although it is still on Beta, I have tried it personally and have not encountered any problems so far. Here I am providing a rough guide to installing Bluestacks on your PC or Mac. Firstly, download the Bluestacks App Player from the link above. At the initial stage after it is running, you would be able to install some apps, however, as Google Play is not available by default, you can only download apps which you can find in the few default marketplace apps installed for you like 1market, Amazon, etc. Navigation is using the mouse and scrolling is by your mouse wheel. You can also use the touchpad on your laptop. To get Google Play on your Bluestacks App Player, go to Appsearch and type in "Go Launcher"
Install the Go Launcher EX App. You will be asked to type in a Google Account which you can type in the same one which you have on your Android devices. Thereafter when you "press" the Home Button which is the round white button with the bluestacks logo, it will prompt you whether to select Go Launcher as the default app for the operation, select it as the default. From here, if you are familiar with Android, you can install themes for Go Launcher and other games and apps using the marketplace Apps or from Google Play. You can find Whatsapp and install it too. The interface is largely the same as what you would get on an Android tablet. Under the settings you can also set whether to display each app in the default view format or in the tablet view format. Toggle each app such that the app appears nicest to you. You can also increase the size of the Bluestacks App Player to fullscreen on your monitor by clicking on the dedicated icon at the bottom right. 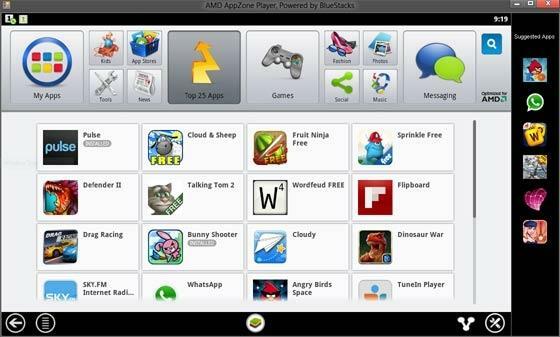 Install the Bluestacks App on your Android phones or tablets to sync your apps to your Bluestacks App Player on your PC or Mac. While most apps run fine, you will encounter problem when an App default view is in portrait as you only get landscape view on Bluestacks. Certain apps which requires multi touch input may also be unusable here as you can only use a mouse to control and navigate. However all this limitation is minor compared to the satisfaction when you are getting a FREE Android Tablet running on your computer screen! If you install it on your latest Windows8 Tablet, you can convert your Windows8 tablet into something like a dual OS tablet! As this is a rough guide to give you quick instructions to installing Bluestacks, if you have further technical issues, you can go to Bluestacks website where there is a Q&A section. How to transfer my wats app acc. with my new android cell with its conversations and media?????? You MUST use back the same account (i.e. telephone no.) that you use to sign up for Whatsapp on PC, on your new Android cell in order to see all the conversations on your new Android phone. There is no way to transfer the conversations over. Can anybody please tell how to configure the bluestack. I'm using a proxy server to access the Internet. My college provides a restricted net access thus unable to run whatsapp on laptop..!!! You can't run bluestack or whatsapp on bluestack? Informasi Kontes SEO untuk para blogger atau MASTER SEO gan.. ada 3 kontes SEO 2014 yang baru running nih, Semua GRATIS PENDAFTARAN. what happen with my software? any sollution?